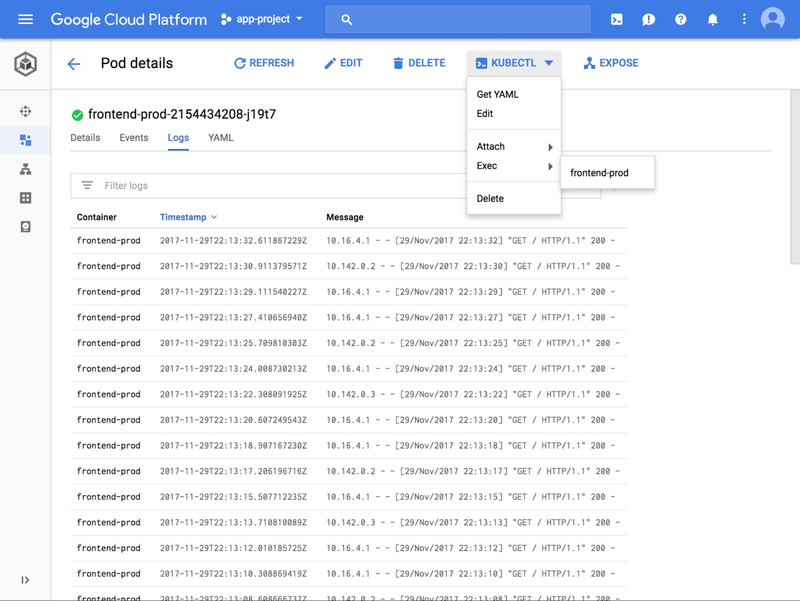 There are two main ways to manage Google Kubernetes Engine: the kubectl command line interface and Cloud Console, a web-based dashboard. 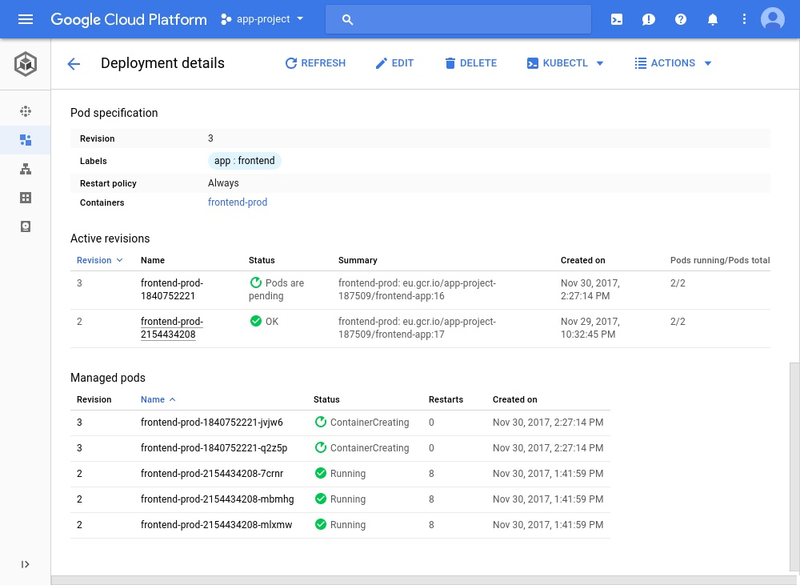 Cloud Console for Kubernetes Engine is now generally available, and includes several new and exciting features to help you understand the state of your app, troubleshoot it and perform fixes. To walk you through these new features, we’d like to introduce you to Alice, a DevOps admin running her environment on Kubernetes Engine. Alice logs into Cloud Console to see the status of her apps. She starts by looking at the unified Workloads view where she can inspect all her apps, no matter which cluster they run on. This is especially handy for Alice, as her team has different clusters for different environments. In this example she spots an issue with one of the frontends – its status is showing up red. By clicking on the name of the workload, Alice sees a detailed view where she can start debugging. Here she sees graphs for CPU, memory and disk utilization and spots a sudden spike in the resource usage. Before she starts to investigate the root cause, Alice decides to turn on Horizontal Pod Autoscaling to mitigate the application outage. 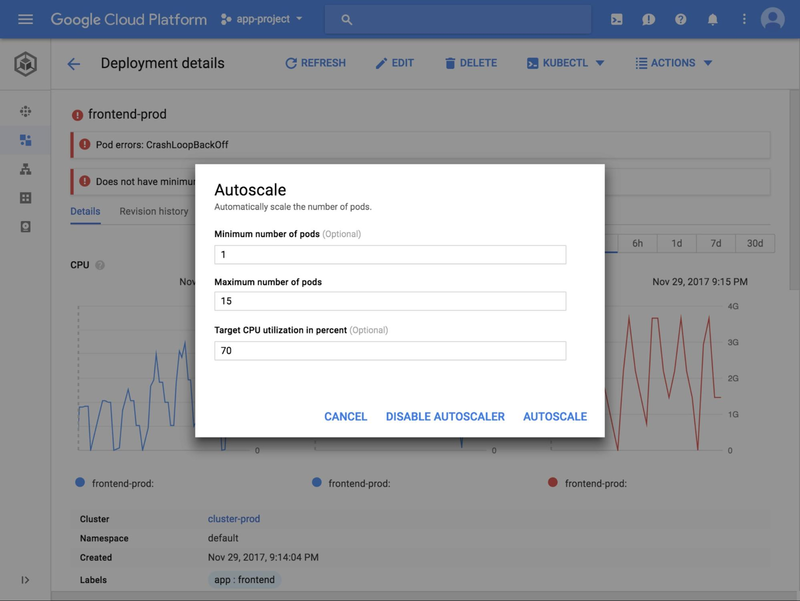 The autoscale action is available from the menu at the top of the Cloud Console page. She increases the number of maximum replicas to 10 and enables autoscaling. Now that the service is scaling up and and can handle user traffic again, Alice decides to investigate the root cause of the increased CPU usage. She starts by investigating one of the pods and sees that it has high CPU usage. To look into this further she opens the Logs tab to browse the recent logs for the offending pod. The logs indicate that the problem is with the frontend’s http server. With this insight, Alice decides to connect to the running pod to debug it further. She opens Cloud Shell directly from Cloud Console and attaches to the selected pod. Alice does not need to worry about remembering the exact commands, finding the right credentials and setting kubectl context—the correct command is fully populated when Cloud Shell loads. By running the linux “top” command, Alice can see that the http server process is the culprit behind the spiking CPU. She can now investigate the code, find the bug and fix it using her favorite tools. Once the new code is ready, Alice comes back to the UI to perform a rolling update. Again, she finds the rolling update action in the top of the UI, and updates the image version. 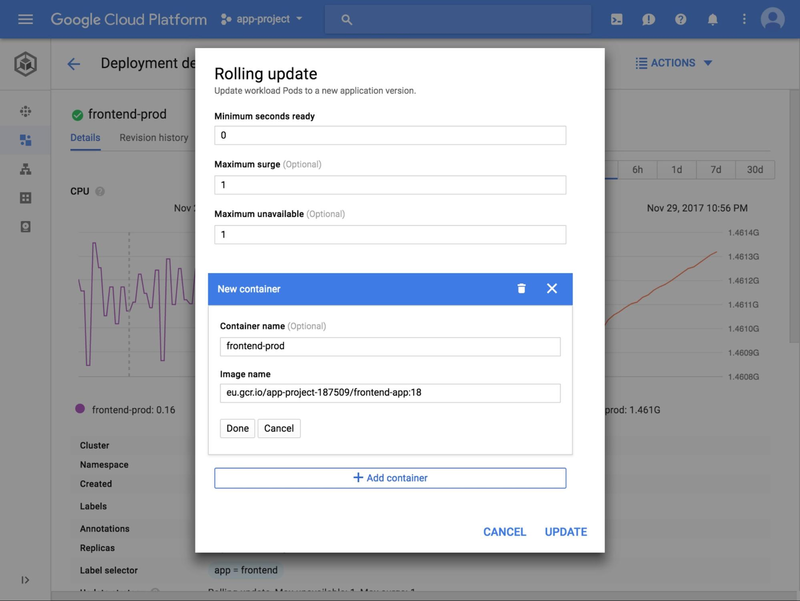 Cloud Console then performs the rolling update, displays its progress and highlights any problems that might have occurred during the update. Alice now inspects resource usage charts, status and logs for the frontend deployment to verify that it is working correctly. She can also perform the same rolling update action on a similar frontend deployment on a different cluster, without having to context-switch and provide new credentials. Kubernetes Engine Cloud Console comes with other features to assist Kubernetes administrators with their daily routines. For example, it includes a YAML editor to modify Kubernetes objects, or service visualizations that aggregate its related resources like pods or load balancers. You can learn more about those features through the Kubernetes Engine dashboards documentation. 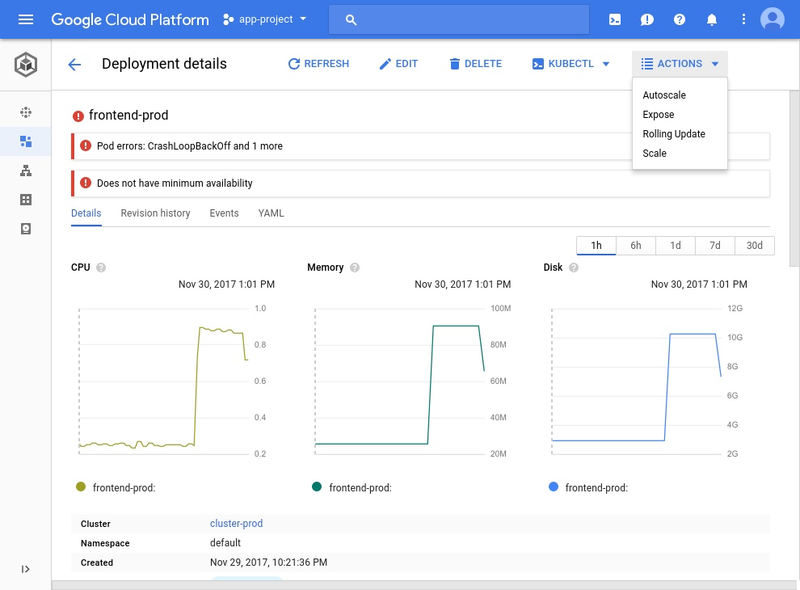 Kubernetes Engine’s new Cloud Console experience also offers improvements for cluster administrators. Bob works in the same company as Alice and is responsible for administering the cluster where the frontend app lives. While investigating the the list of nodes in the cluster Bob notices that all the nodes are running close to full utilization and that there’s not enough capacity left in the cluster to schedule other workloads. He clicks on one of the nodes to investigate what’s happening with the pods scheduled there. He quickly realizes that due to Alice turning on the Horizontal Pod Autoscaler there are now multiple replicas of the frontend pods that take up all the space in the cluster. Bob decides to edit the the cluster right from Cloud Console and turn on cluster autoscaling. After a couple of minutes to scale up the cluster, everything starts to work again. 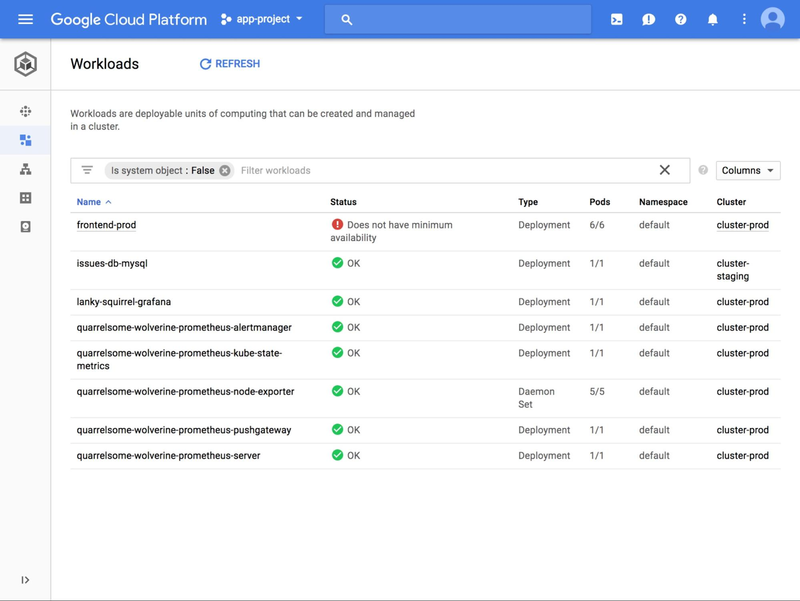 These are just some of the things that you can do from the Kubernetes Engine Cloud Console dashboard. To get started, simply login to Cloud Console and click on the Kubernetes Engine tab. Let us know how you like it by clicking on the feedback button in the upper righthand corner of the UI. This week the Kubernetes community gathers in Austin for the annual #KubeCon conference. The Google Cloud team will host various activities throughout the week. Join us for parties, workshops, and more than a dozen talks by experts. More info and ways to RSVP at g.co/kubecon.